The 1.3 billion tons of food, which is enough to feed 3 billion people, is lost or wasted every year worldwide. This problem is particularly acute in the Asia Pacific region where more than half a billion people suffer from hunger. Yet, according to the United Nations approximately 42 percent of fruits and vegetables and up to 30 percent of grains produced across Asia and the Pacific region never reach the tables of consumers. Industrialized Asia contributes 28 percent of the total food wasted in the world while South and Southeast Asia are responsible for nearly a quarter of all food waste globally. While these statistics are quite alarming, it is not surprising that plenty of companies and organizations in the region provide innovative solutions and ideas to address sustainability challenges faced by the food system. We have collected some of the most exciting initiatives from the region. In order to connect the innovators with committed companies in the region, the Forum for the Future has created the Food Loss Consortium. It is a platform for businesses to form partnerships with like-minded companies. The goal is to understand how they can work together to test industry-transforming investments for a more sustainable food supply chain. Gone Adventuring, Singapore-based startup company, is also helping corporates and brands make sustainability and social responsibility part of their business model. It bridges companies, communities and consumers to tackle important social and environmental challenges. Some companies are already operating in the region implementing innovative tech solutions in different points along the supply chain. EcoHub is applying technology to improve the profitability and sustainability of seafood supply chains. Open Taste is an online marketplace offering premium quality food delivered straight from the farm to the door of consumers. The items ordered are picked up from the farm and delivered on the same day. In this way losses are reduced and food does not have a supermarket shelf life any more. iGrow is a marketplace that helps underemployed farmers, under-utilized land, and investors to produce high-quality organic food and sustainable incomes with cloud-based agricultural management software. 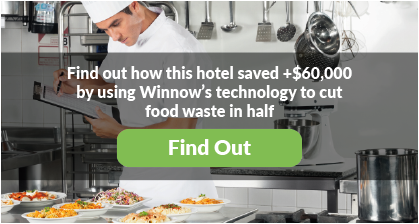 Winnow opened its first office in Singapore last year to help solve the issue of food waste for the hospitality industry in the region. Since our arrival we have expanded to several new Asian markets proving the solution has application in almost every kitchen worldwide. Our clients typically save 3-8% on food cost and reduce their environmental footprint at the same time. We believe the secret of solving the issue of food waste lies in the commitment of companies to harness the value of food lost in the supply chain and work with innovators to solve the issue together. Forward thinking companies doing so have a real opportunity to act and benefit both the environment and business. If you want to make sustainability an integral part of your business and would like to know more how we can help your operations become more profitable by reducing food waste, get in touch with us.